Who are these people making all those changes at that old house and barn? The neighbors are stopping by and give us encouragement as we slowly breathe life into this property. Creating a space for the community for art, science, events and hosting at the 4th Street Studios has been a dream of ours for so long. Learn about our VISION for this property here. Keep reading to find out how we got here and what we do. We are a botanist and an artist couple that has been married for 30 years. We love travel and adventure and have hosted over 400 guests in our homes in Laramie, Steamboat and Austin. The 4th Street Studios is our passion at the moment and we are excited to create something special for Laramie and for our community! A little background…. We gave up “the life” 18 years ago and moved from our crazy life in Tucson (where I owned a CPA practice and David was working towards tenure) to a small village in France with our 3 young boys. We sold our house, cars and just about everything else. That year my love for art, cooking, history and architecture came to life. After France, we selected Wyoming as our home base because of the similar lifestyle to what we had in France. Slower pace, enjoy life, ride bikes everywhere, go for a hike, a ski, grow a garden and enjoy community. I began remodeling our old house, creating concrete countertops, and David helped me build a small studio and I starting playing with art. As I was hired for interior design and art commissions, I wanted more so began my journey to my BFA. Over the last 5 years, we have remodeled and created spaces for over 400 guests in Laramie, Steamboat and Austin by remodeling older houses and bringing back their character. It has been so fun using our houses to host people that want a personal experience and now we hope to expand those experiences to art and science. Science, nature and architecture inspires my art, but houses, architecture and creating spaces with creative function is more than my full time job and I love it! David enjoys his full time job as Department Head of Botany but when he isn’t there, we travel and work on plans and look for vintage architectural treasures for the 4th Street property. Creating Science Loves Art with some science collaborators during a 1 year grant was so much fun. 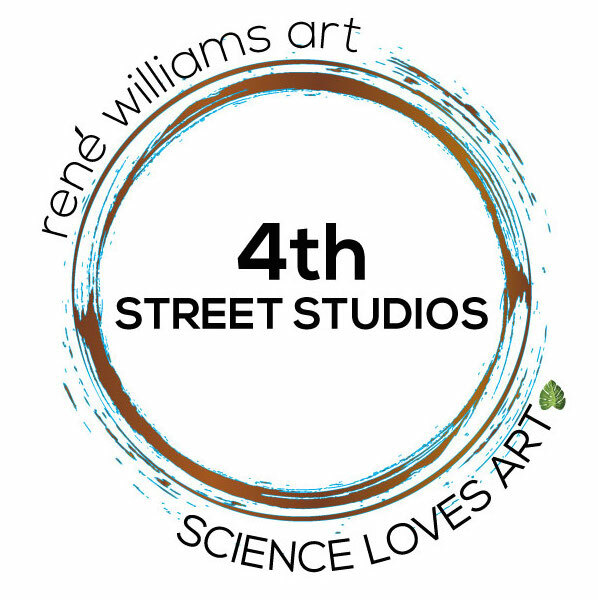 Science Loves Art has become a nonprofit and having 4th Street Studios as a place for science and art to call home is a dream come true! Working with Wyoming scientists on the Micro Project is an amazing opportunity and I’m learning so much about the importance of microbes and their functions to continuing our health and environment. More coming on this project! Keep in touch and hope to hear from you!